After the Super Bowl leaves town San Francisco can stop vandalising corporate statues and go back to focusing on more important projects, like imagining the day the Bay Bridge bike path might actually cross the entire San Francisco Bay. A new bike and pedestrian path opened along the reconstructed Bay Bridge in 2014 but residents are rightly dismayed that the path stops mid-span, forcing riders to simply roll back to Oakland. 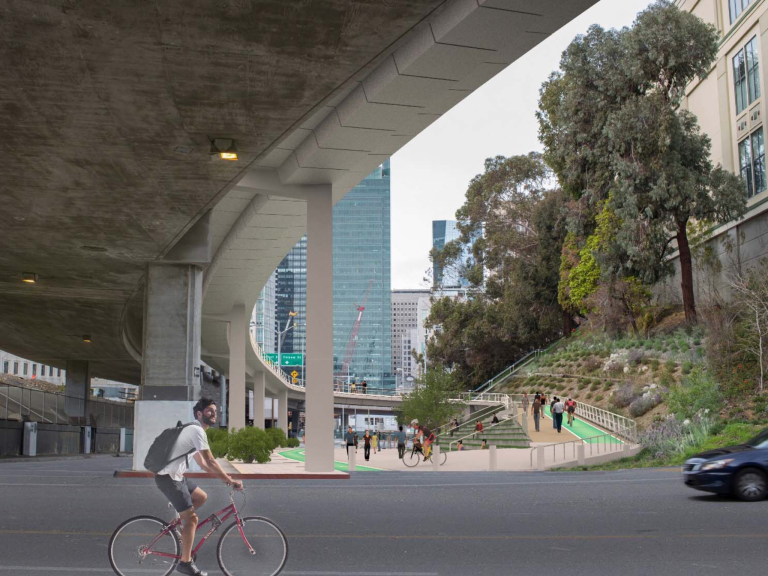 An extension will take the path to Yerba Buena Island as soon as this summer, but it will take another $300 million and possibly ten more years to get cyclists all the way to San Francisco. But still, a city can dream, right? New concepts for the path have been presented by engineers at Arup and it’s not an easy proposition. 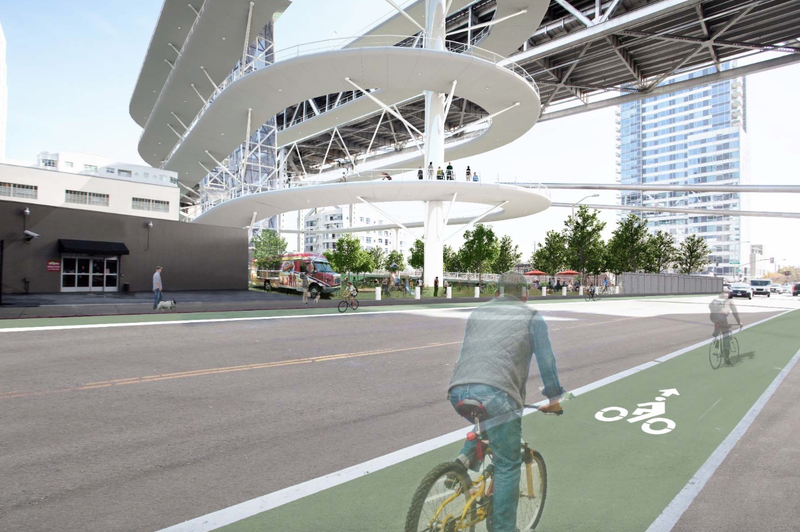 As you can see from the proposed schemes above, the bridge enters the city high above street level, requiring access via either an insanely long ramp or a series of bike elevators. That’s actually not that radical: there’s precedent in this project which just approved in Copenhagen. But the design is only part of the challenge. The biggest problem, structurally, is the challenge of essentially stapling on an extra lane to the bridge, which requires affixing old steel to new steel (not ideal, from an engineering perspective). And then all that weight will cause the bridge to sink a little, so it’ll need to be ratcheted up a bit by the cables. 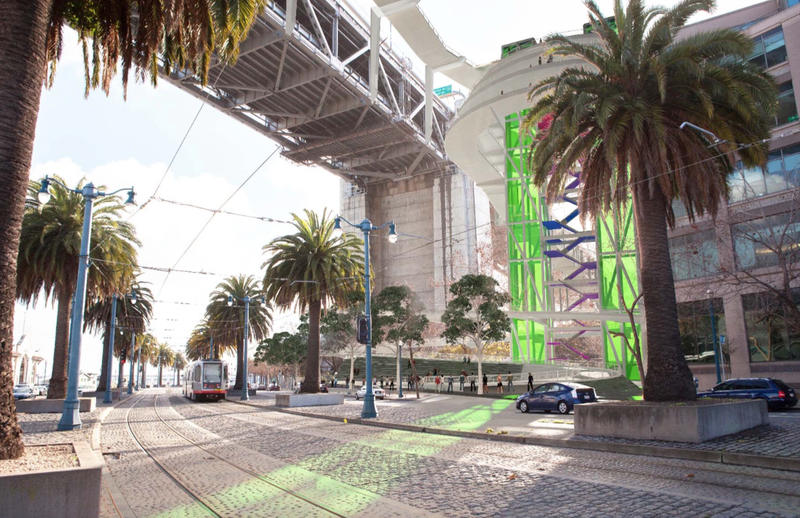 As you ponder the completely perplexing thought that this city approved a bridge which only serves vehicles, consider my idea for how San Francisco might be able to save itself ten years and $300 million.